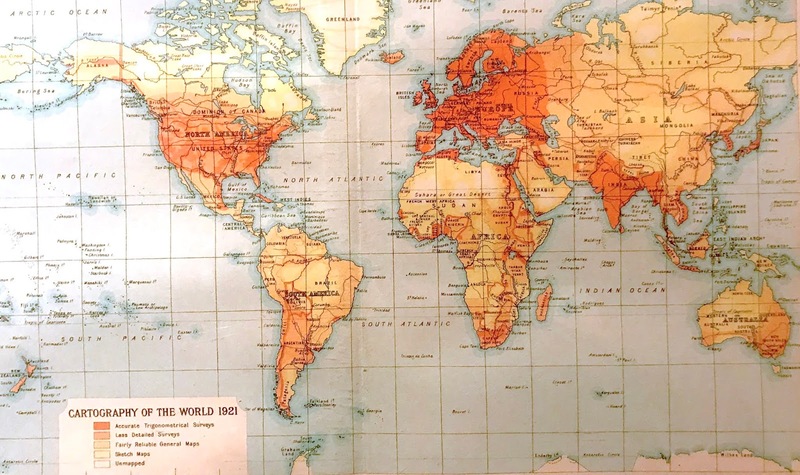 Detail of a 1921 map that visualizes its own accuracy: red regions are accurately mapped, orange less so, etc. Historians love maps, but we don't always use them to their full potential. I'm as guilty of this as anyone; for my own book, I'm probably going to keep things cartographically simple, like most other academic historians. 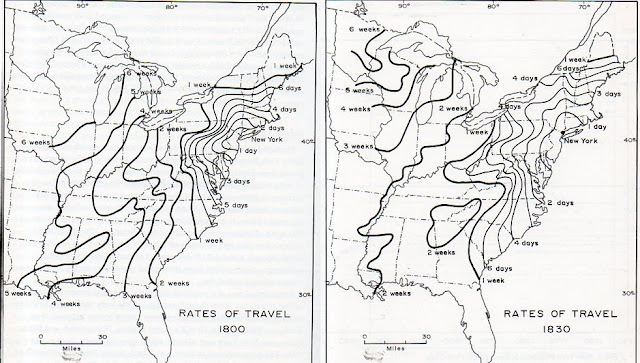 A few straightforward, black-and-white maps with labels for the key places mentioned in the book. Nothing innovative; just a practicality to help the reader. Sometimes, however, historians manage to do something truly interesting with maps. 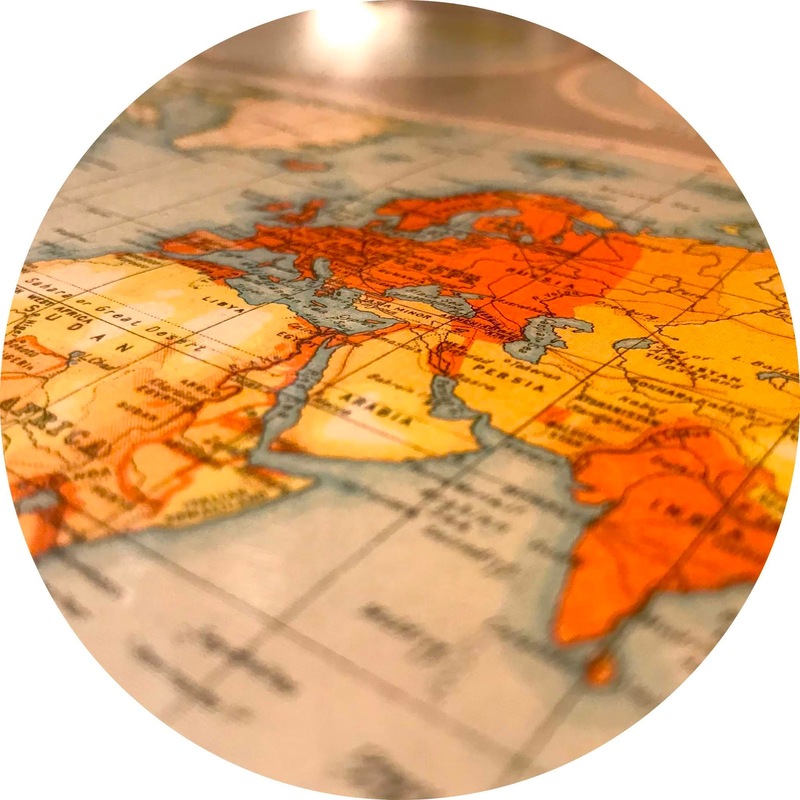 My favorite example has long been a series of maps by the French historian Fernand Braudel, featured in his first book The Mediterranean and the Mediterranean World in the Age of Philip II. The history of the book itself is pretty fascinating in its own right: remarkably, Braudel managed to write much of it while he was in a Nazi prisoner of war camp in Lübeck, Germany, between 1942 and 1945. Three of Braudel's maps from the book, which I've stitched together into a single GIF, brilliantly depict the time it took for a letter to reach Venice if it had been sent from a number of different cities: Moscow, Lisbon, Istanbul, and more. I didn't know the name for this type of map until recently. 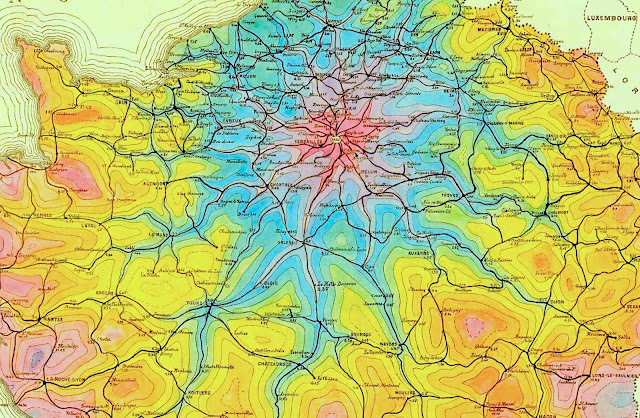 It turns out that they're called isochrone or isochronic maps. An isochrone is, according to Wikipedia, "a line drawn on a map connecting points at which something occurs or arrives at the same time." E. Martin, "Carte des communications rapides entre Paris et le reste de la France," 1882, via the University of Chicago Map Collection. “Minimum Railway or Tramway Time Zones,” 1910-1922, via the State Library of Victoria. There's something biological about these maps, which sometimes look more like cell cultures in a Petri dish than the stuff of atlases: it's as if they reveal the unthinking, unplanned, semi-random aggregate behaviors of huge numbers of humans. 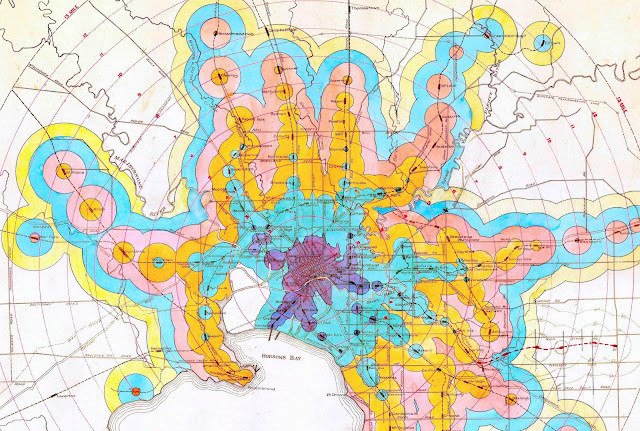 There's also something distinctively modern about such maps. They rely on large amounts of information, which needs to be at least somewhat accurate, and hence it wasn't really possible to make them until fairly recently. The creator of the first isochronic map appears to have been Francis Galton. 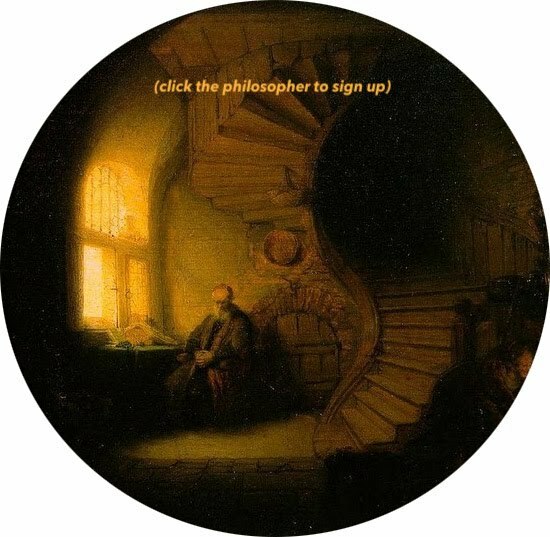 He was Charles Darwin's cousin and colleague (here are some letters they sent to one another), and one of the founders of the concept of what came to be called "social Darwinism." His legacy is mixed, to put it mildly. 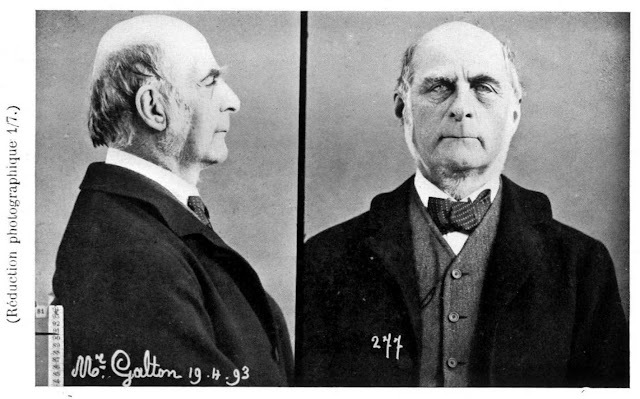 Galton's advocacy for scientific racism and eugenics would, after his death, indirectly inspire Hitler. 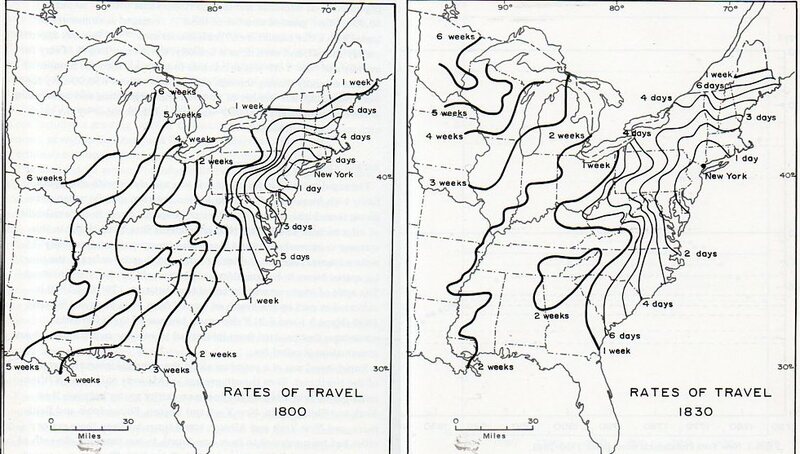 But he was also a pioneer in the field of data visualization: he invented the idea of composite portraiture and created some of the first systematic weather charts. 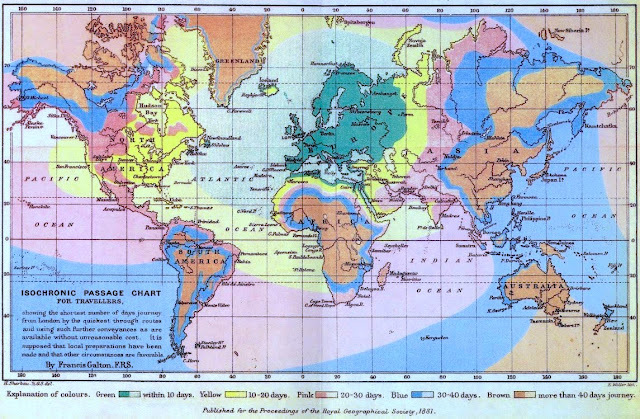 In 1881, Galton also published one of the first isochronic maps. Francis Galton, "Isochronic Passage Chart for Travellers," London, 1881. 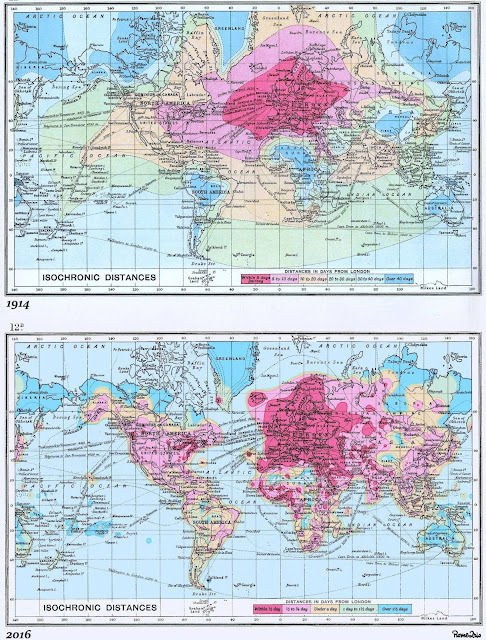 The map was color-coded to show the expected travel time from London to anywhere on earth. Green areas could be reached in less than ten days, yellow in ten to twenty, pink in twenty to thirty, and so on. It was clearly a rough approximation, and I doubt that it was useful to many people on a practical level. But as a new way of thinking about data visualization, it was a breakthrough. One product of doing historical research is that you end up with vast amounts of metadata. That's what Braudel so shrewdly capitalized on with his Venetian letters map: anyone who works in historical archives for long will end up leafing aimlessly though stacks of letters sent by bureaucrats. Usually, when we do this, we're scanning for a specific bit of information or thematic element. But we also happen to be accessing all sorts of additional data in the process: when and where was the letter written, when it was received? Who read it, and what did they underline? Or even, how damaged is paper? What color is the ink? The answers to all of these questions, taken in aggregate, have the potential to tell us something new. Isochronic maps relating to travel times for humans and letters have been particularly popular with historians, because it's so easy to find archival documentation relating to the setting-off and arrival points of both. Thanks to Leon Jackson for sharing these with me. Via Reddit user r2r_, originally posted in r/dataisbeautiful. 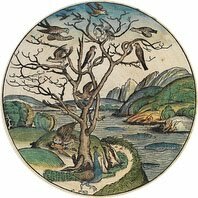 Another interesting example of the technique comes from a vintage map I own, a detail from which began this post. It depicts the state of English geographic knowledge of the earth in 1921, with high cartographic accuracy labelled in darker reds and lower accuracy shading into orange and yellow. Entirely unknown areas are in white; most of them seem to be in the Arctic Circle and the Sahara. I'm curious whether other forms of information that historians come across in archives could also be visualized in this way. One example that comes to mind from my own research in the history of drugs is an isochronic map of travel times for important drugs: i.e., how long did it take for opium to travel from India to China in 1800? What about tea? Sugar? It would conceivably be possible to create such a thing using records relating to taxation and purchasing at different points. Or, perhaps isochrones could be based on prices for drugs or other commodities: where are the boundaries between the prices of silver, say, or tobacco, at different time periods, and how do these differences flatten out as globalization accelerates? If you have any ideas for other interesting approaches to mapping history, please let me know in the comments.